MT Metatron is a Japanese professional anti-aging skincare brand, which means that the products are only sold in beauty salons and clinics. I had the opportunity to test some of the products, so I thought I’d let you know as the results were quite surprising! MT Metatron was established in 2004 and today their products are used in more than 3000 beauty salons and clinics in Japan and also in South East Asia as well as in Europe. MT Metatron’s strength and particularity are based on the fact that their cosmetics contain active ingredients that act to not only to the outer layer of the skin, epidermis but also underneath to dermis and even to the muscles to counterattack the aging process. Below are the 3 main ingredients used in MT Metatron skin care products that constitute the anti-ageing process described above. Also used in other skincare products, panthenol is a derivative of vitamin B5, that has a strong moisturizing effect, as well as an anti-inflammatory effect. It also improves the healing of the epidermal wounds. Panthenol acts on epidermis to create a smooth and soft skin. Not specific to MT Metatron, carnosine, an amino acid compound, is used in some cosmetics for its antioxidant function. In addition, carnosine has also an anti-glycation effect. 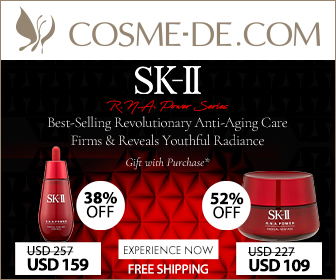 Lately, some skincare brands approached skin aging from the glycation aspect, linking it with the formation of Advanced Glycation End products (AGEs) which hasten the aging of collagen and elastin. This is where carnosine acting on the dermis, demonstrates its anti-aging effect. DMAE is a natural compound found in our brain which is needed to produce neurotransmitters that control muscles tones in our body. DMAE is said to have the ability to lift and firm the skin (Dr. Nicholas Perricone’s clinical tests) from the muscles level, thus to act as an anti-aging element. It also includes hyaluronic acid and plant placenta for moisture and anti-oxidation. The lotion is slightly thick and has a yellowish color. I felt that it doesn’t penetrate easily the skin, which is similar to another hyaluronic acid based lotion from Hada Labo. But after rubbing the face several times, the lotion goes into the skin, leaving it first a bit sticky but very soon after completely fresh and smooth, almost too light in term of moisture. This is the signature product from MT Metatron, which is supposed to bring instant lifting effect. It contains DMAE, Carnosine and Lipoyllysine which helps smooth out the skin. It’s quite a watery translucent gel that is easily spread onto the skin. After the application, the hands stick to the skin, but again like the lotion, after a while, the surface is smooth and not sticky. Also by applying it upward, I felt the lifting effect, especially because I have eyes sloping downward, it was easy to see the difference. Same thing with my wrinkles between my eyebrows (which shows by the way that I am lately often upset! lol), I saw that after a few days of application of the serum and stretching movements, they disappeared. This cream contains panthenol, ceramide derived from rice-bran, kava extract and all together moisturizes the skin, restores cells, fights inflammation, as well as encourages the production of our own intercellular lipid. It’s a white quite thick cream which is not greasy at all. After the application, the surface is moisturized and a bit sticky but not greasy, so it’s not felt heavy at all. All the products were gentle to my skin and I never felt any irritation. The above-mentioned products have nothing impressive when used for the first time and after application. However, I have been using the 3 products together for 3 weeks now and my skin never looked that good!! Skin troubles have disappeared: even though I don’t have so many troubles, because I have a sensitive skin, sometimes it happens that I get rashes or that my skin makes a reaction to various things, both physical and internal. But I haven’t been experiencing any of these for the last weeks. Maybe the anti-inflammatory effect helped strengthen my skin. The appearance of my pores shrank: pores are definitely less visible since I started using these products. Considering the hot and humid summer that we have been living here in Tokyo, the efficacy feels even more incredible. My skin texture got unified: there is no roughness, no hardness, and my skin is completely unified. Usually, I exfoliate my skin with a special care as after some time I feel my skin has become tough. But since I have been using MT Metatron, I never felt that my skin was hard and haven’t felt the need to exfoliate yet! My skin is glowing: it’s obviously linked to above. It’s reflecting the light in a uniform way. My skin visibly looks much better because of the uniform texture and because it’s well moisturized and I have fewer wrinkles. I discovered here some really high-quality skincare products. It’s difficult to say which of the 3 products was performing so well, as I have been layering them all. One sure thing is that my skin has completely changed and I am amazed. So I am really happy to share with you this still not known enough brand with incredible technologies and performances. Please do try if you have a chance! You can find the salons in Japan using these products here. If you are not in Japan and are interested in knowing more you can directly contact the company here. Very nice blog post. Icertainly appreciate this website. Contnue the good work!